Imagine walking down the sidewalk in downtown Albuquerque, it’s 3:30 in the afternoon and the temperature is hovering 100-degrees heat. You peer into the window of a local restaurant only to see your own reflection and the bright light refracting back at you. You can simultaneously feel the oppressive heat of the sun as well as another heat source radiating off the tinted glass. I imagine anyone reading this has experienced this a time or two walking around our downtown or in other areas of the city. Whether as a pedestrian, or even as a driver, there is an architectural feature that makes an enormous difference to the quality of the public realm: window transparency. Sure, there is a utilitarian reason for tinted windows in our region, but designers often fail to consider the unintended consequence of this common design choice. There are many principles associated in generating a high quality pedestrian environment in our cities, and one involves the creation of an interesting streetscape that engages our senses at a speed that matches our 3-5mph average walking speeds. 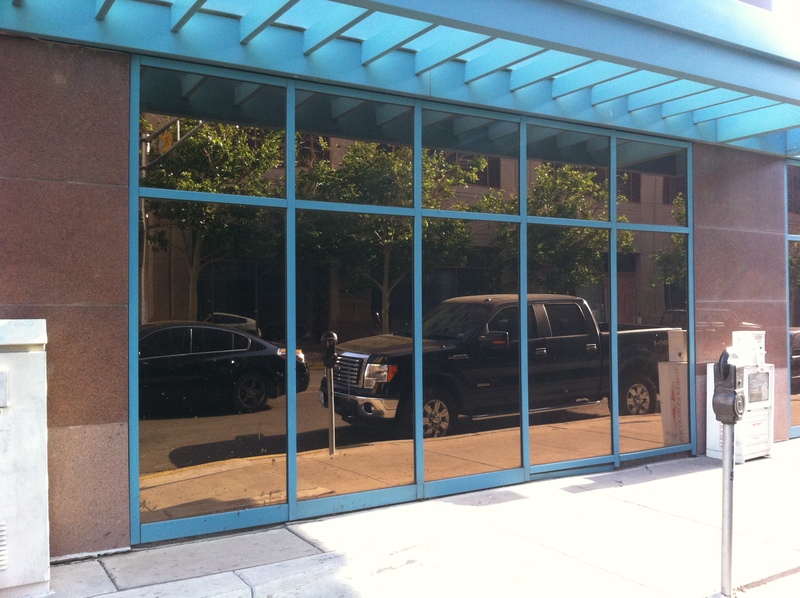 Tinted glass erodes this quality by hiding what lies behind and simultaneously contributes to heating the urban environment by reflecting the sun back into the street and sidewalk. A view (interesting or not) of life beyond the curtain wall helps to distract us from the weather. A view of socializing people, or one of merchandise are just a couple of examples of the way in which transparency contributes positively to the experience of the urban streetscape. The same visual effect can be observed in our high rises around the city. Tinted glass contributes toward the creation of more brutal structures. An example that comes to mind is the recently renovated midrise structure at the southeast corner of the Big-I interchange. Previously, the triangular office building was coated in tinted glass windows, reflecting its surroundings. It was the equivalent of a triangular, onyx rock. The renovations included replacing the glass with a combination of transparent and sea foam green glass, resulting in a structure that is less brutal and monolithic, offering glimpses through the structure. Each level nearly appears to levitate over the previous one. The office building no longer anchors the space it is in quite the way it did before, but instead now engages its environs in a more delicate way. Its presence is no longer recognizable by only its unique, triangular shape, it is now somehow more sophisticated, allowing us to see through it and understand its skeletal structure. New Mexico’s famous sunshine and variable weather necessitate solutions that temper our built environment. However, our sometimes harsh environment provides opportunities for innovative solutions. Let it be known that I am a fan of diversity in architecture. All art is subjective and in no way would I wish to ban any (ok, almost any) style. However, the design of our cities must consider how each building affects the composition of the city, which is experienced by people while walking, riding bicycles, and driving or riding automobiles. I agree completely about tinting on human-scaled streetscapes…you need only compare the new Adieux Cafe downtown with the tinted-up nails place that came before it to understand how much more alive a building becomes when you can see inside. As for the Star Destroyer building, I see where you’re coming from…but that building and its site are both so far from any kind of interaction at a human scale that it hardly seems to matter. Its audience is so clearly the folks on the freeway that closer-up interactions seem like they’re beside the point. But perhaps losing the tinting is an improvement there too…tearing down the derelict half-built cookie-cutter hotel in front of it would go even farther to improving its setting, however. I had an identical reaction to the renovation of the triangle building (does it have a name? 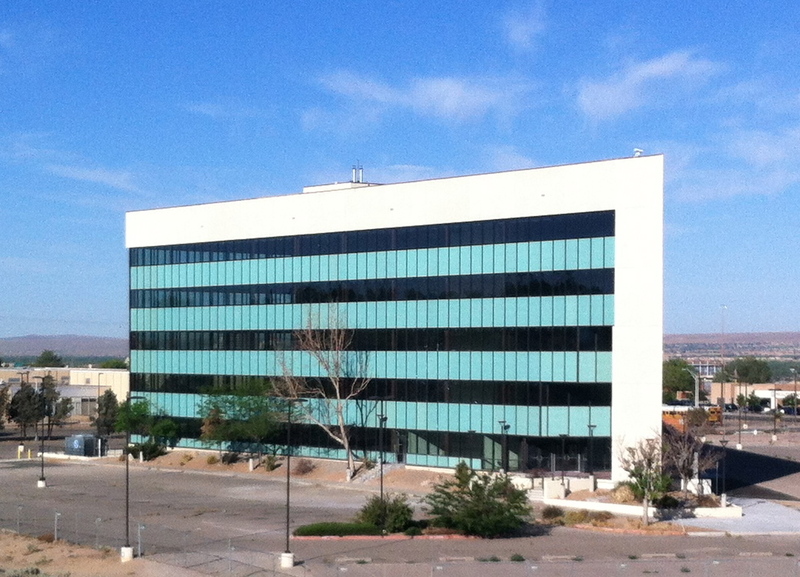 ), Tim; the expression of the internal structure outwardly is rare in ABQ and was a pleasant surprise. The transparency of the glazing brings so much more complexity to the architecture. Maybe not the complexity found in the works of Koolhaas (esp. University of Utrecht Educatorium or Seattle Public Library), but a complexity worth investigating further in the architecture of urban ABQ. The trick in our environment is not so difficult to achieve if architects choose to approach design acknowledging shading and transparency as a goal; it’s when shading and transparency are afterthoughts that we find architecture skinned in reflective glazing. As an aside from my experience working in a tinted mid-rise is the unfortunate occurrence that you discover if working into the evening; the reflective glazing doesn’t allow the user to gaze upon the city stretched out before them, the view becomes the ugly mug from which they gaze (I suppose it’d be different if I were more attractive). I do wonder how the triangle building will solve the additional solar heat gain mechanically (did they change the mechanical system? ), unless they’ve purchased some uber expensive glazing that allows in light but blocks the additional radiation. Great write-up, TIm! Thank you very much.